MINT - this is the first recipe in the series collaboration with Sarah of Watershed Floral. To read our advice on cultivating and cooking with mint, click here. 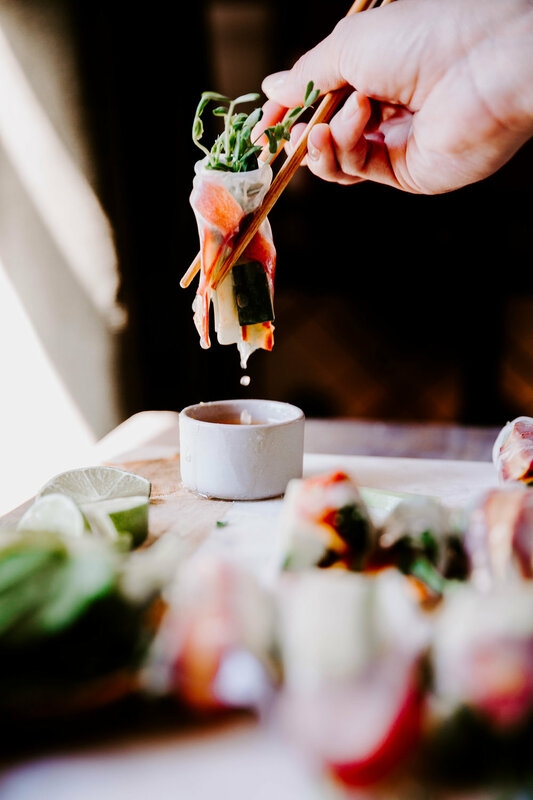 Okay, wait casual spring rolls? What does that even mean? Well, the truth is I threw in the word 'casual' because I never want anyone to think that certain dishes or "techniques" are off-limits to the average home cook. This recipe is one of my favorites because no matter what it feels special, but please don't be turned off by the wrapping and rolling - it doesn't have to be perfect, it just needs to be ready to dip! 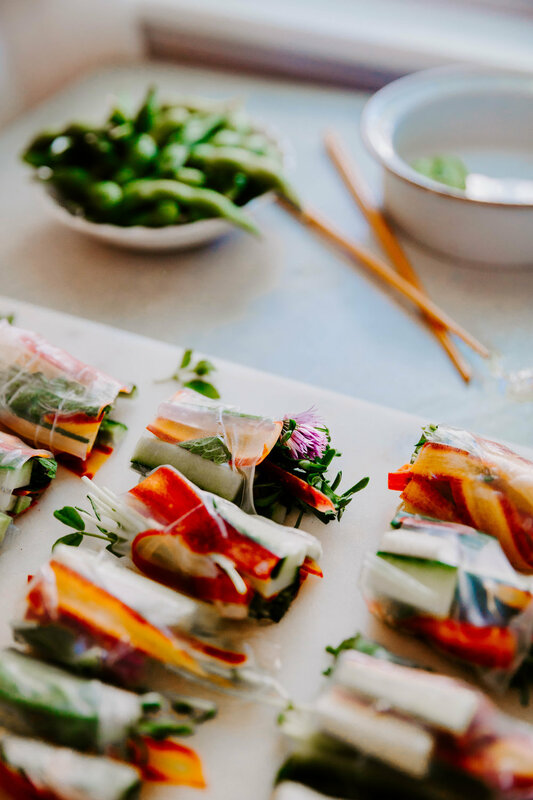 Just think of it like this.. spring rolls are a great way to pull fresh veggies and herbs together in a fun new way (read: without making a salad). Sign me up! Why mint? Well, Sarah and I want to bring you recipes and information to help you understand how fresh herbs elevate a dish. We want to empower you to feel comfortable using herbs on your own terms from here on out. Now, I suggest you use mint in this recipe because it adds a really fun flavor, and will help you understand its savory applications for future use. But honestly, any of the fresh herbs from this series would be amazing. Just promise me no matter what you'll add fresh herbs. Best to soak the wrappers 2-3 at a time. The more you submerge at once the longer they sit and absorb, and the harder they become to roll. If imperfection isn't your thing and you'd prefer a really clean look (hey, no judgment here), finish rolling everything then go through and cut off both ends. You should ideally cut right where the thickness of the center of the rolls begins. Then go ahead and cut them in half. This will give the rolls a stark almost sushi look. If you accidentally under-stuff a roll, just trim off the excess wrapper. It should be just fine. My go-to ingredients are shaved carrots, cucumbers, some sort of stalky sprouts like pea shoots, mint and chives. My second favorite combo is with green onion and cilantro. Have fun and play with this one, there's barely a recipe here guys. I like to fill the majority of the rolls with vegetables, then add a few pieces of fresh herbs, and finish the bulk with stalky sprouts. Feel free to play around with whatever proportions you like best. For the dipping sauce. I added a few pieces of mint in at the end and I loved the way it tasted. If it's not peach season when you go to make this, use any seasonal fleshy fruit with the vinegar and optional toasted sesame oil. I think you'll be ready to use this one in everything. Maybe you'll make a salad dressing. Or heck, stick a straw in it. Yum, yum, yum. I like to serve this dish with cold sticky rice, pickled veggies like kimchi or fermented beets, and edamame or seaweed salad. It's basically an Eastern charcuterie board. Oo I like that. I'm going to run with it. This recipe can be adapted very easily with whatever fresh veggies and herbs you have at hand. Have fun playing with this one! Prepare each ingredient and form an assembly line. I like to layer veggies then herbs and fill it out with sprouts/shoots. Line a cold sheet tray with parchment paper and set at the end of the line. Soak the wrappers according to their directions, only soaking 2-3max at a time. Making sure to let any access water drain from the wrappers before beginning assembly. Follow the line of fillings and layer until it feels as if they're slightly over-filled. It may take one or two tries to determine the right proportions. Fold one side of the wrapper over the filling, and follow with the second to seal closed. Don't worry about closing the ends. Once you've finished assembly, cut each roll in half and place on slightly dampened serving tray. If you don't like the look of the open ends, cut them off with a sharp knife. See the notes on the blog post above. Prepare the dipping vinegar and enjoy! This makes a great dipping sauce, salad dressing base, or anything else you can dream up. If peaches aren't ripe or in season, use any ripe fleshy fruit. The peach should be so ripe that the skin basically peels right off. Don't worry about removing the skin too much though, just get as much as you can. Muddle the peach in a small glass measuring cup. Add vinegar and maple syrup and optional oil and mint. Serve and enjoy! Cooking from your herb garden : MINT!